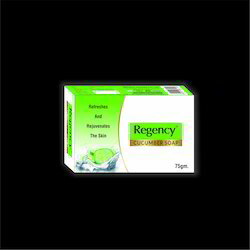 Allow this powerful cucumber formula to cool your senses and give you a feel of rejuvenation. Regular use of Ozonaa’s Cucumber Soap will make you forget the heat. - We have very exotic herbal cucumber soap with pure exacts of cucumber , Very soothing during summer and keeps the skin soft and manages skin tan. - The soap is called Cucumber delight. - Packed in beautiful recyclable pouch. The cool cucumber with its antioxidant agents, hydrogen and silica acts well on tired skin reducing the puffiness and tones the skin by moisturizing and tightening the pores; giving the glycerine smooth finish. Aloevera helps maintain natural moisture of the skin and improve the suppleness and flawlessness of the skin. Cucumber is an excellent toner as it immediately tightens open pores. The cucumber soap offered by us carries the clean and fresh fragrance of cucumber, which is very invigorating and energizing. Bathing with our soap is an easy way to get benefits. It soothes the hot skin and helps ease sunburn. Ideal for a fresh start and for ending the day, as cucumber stimulates the mind and body and is very effective against fatigue. Bathing Bar with Pure Essentials Oils This bathing bar is made from Glycerine Soap Base, Olive Oil, Essentials Oils & Natural Extracts. At the time of packing 125 g/4.41 oz. Ingredients: Soap Base, Glycerine, Mint & Cucumber Extract, Fragrance, CI19140, CI42090. We offer Cucumber Soap that contains essential oils of peppermint and cucumber. Peppermint acts as an antiseptic and good for acne and pimples. It also has cooling properties and refreshes the skin. Cucumber acts as a cooling agent and a sun screen.